All links are to Buffalo, NY, pages unless otherwise indicated. [In Egypt] During important religious rituals or official coronations, armchairs would be used instead of side chairs. Considered the highest seat of honor, the armchair was reserved for the pharaoh and was richly decorated. 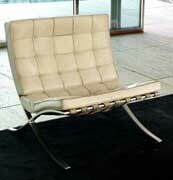 An established hierarchy developed with the evolution of various seating units. Social prominence determined what piece of furniture the Egyptian sat upon. A stool was better than sitting on the floor, but a side chair had a back on it and was much more comfortable. 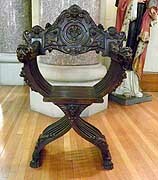 The highest ranking Egyptian would sit in an armchair since this type of chair had the comfort of both back and arm supports. Moreover, the political hierarchy of seat furniture continued into the Greek and Roman periods with authoritatively designed throne chairs. 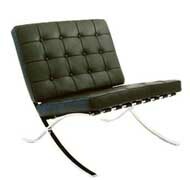 The armchair was also a seat of prominence during the Medieval period. When receiving visitors to the manor, the lord sat in a massive armchair with the lady of the manor seated in a side chair. During banquets, the lord and lady sat side by side while their guests sat on benches, or stools, some of which were brought by the guests themselves. This hierarchy continues today in the formal dining room. Armchairs are placed at each end of the table for the host and hostess, while guests sit in side chairs. 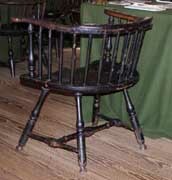 A late 17th-century English or American chair with split turned stiles or flat bars for the uprights of the chair back. A more elegant and polished variation of this type of chair back was popular in the Hepplewhite period, Hepplewhite's term to describe the carved and shaped upright bars that are curved to fit the shield of an open shield-back chair or sofa is bar back. 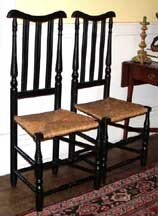 Illustration: William and Mary caned-back chair - George Wythe House, Williamsburg, Va.
A Queen Anne style, American colonial chair. The back splat is shaped like a violin, fiddle or a vase and the seat is usually made of of rush. The chair may have cabriole or saber legs. 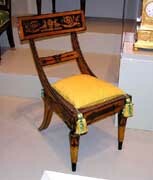 A similar chair appears in Louis XV-period furniture. Originated in medieval Italy and spread through Renaissance Europe. Girolamo Savonarola (1452-1498) was an Italian Dominican priest and leader of Florence from 1494 until his execution in 1498. A term used to distinguish the armless chair from the armchair. 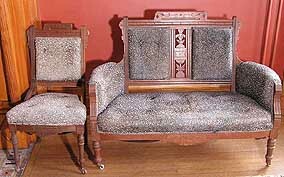 The side or armless chairs were evolved in the 17tb century when they replaced the stools and benches which were provided for persons other than nobility or the beads offamilies. Illustration: Ansley Wilcox Mansion / Theodore Roosevelt Inaugural Site . 1730-1830rs were usually painted solid green, red, black, yellow, or white; such paint also protected the wood.